I missed the pullback in EURUSD from the 1.4240 top as I was reluctant to enter long for two reasons: First, the price is near the channel resistance of the current 4h uptrend. Secondly, the pair has moved too far out from the Keltner Channel which is my comfort zone to execute a trend following entry. The EURCHF has stayed below my stop level for most of the Asian session then jumped 70 pips ahead of the European open. The low overnight was 44 pips away from my entry level which is more than the initial risk that I accept on my trades therefore I consider my stop being valid yesterday. I have re-drawn my trendline containing the pullback and now look to enter long on a pullback close to the prior highs near 1.2990. I have found this article in the Nov, 2010 online issue of the Futures Magazine. 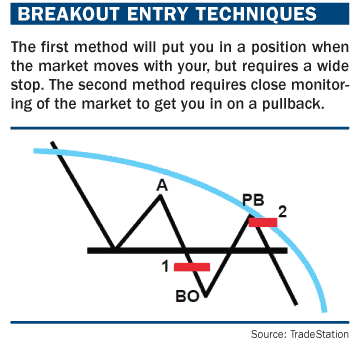 Part of the article (on Page 2) explains the Breakout Pullback entry method which is crucial part of my trading strategy. The schematic “Breakout entry techniques” (right) depicts two different means of trading breakouts. Both are short entries. Entry one makes use of a sell stop market order with a price just outside (below) the breakout level. Some traders prefer this type of entry because it places them in the market when it moves in the direction of the breakout. However, it requires a somewhat larger initial stop-loss because of the breakout pullback phenomenon. Often, the trader will need to set an initial stop loss above the most recent swing high (labeled “A” in the schematic). Placing the initial stop just inside the breakout level (above it in the case of a short), puts the position at risk of being stopped out from normal market jitters. Entry two in the schematic uses a sell limit order with a price determined to be at the maximum extent of the breakout pullback. In real-time, this level is not easy to determine. A 20-period EMA reference can be used or the trader can closely watch price action and when the market appears to have exhausted its pullback, a limit order entry can be placed close to the market. The breakout pullback trade is attractive because the initial stop loss can be set just outside the entry price. This can be the previous swing high (“A”) or the 20-period EMA level.